The personalized Hanukkah plate is perfect for celebrating this fun holiday. You and your child will enjoy festive traditions with this beautiful ceramic piece. A boy holding a tray of potato latkes sits in the center surrounded by dreidels. 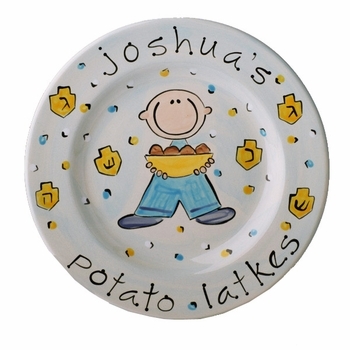 The outside of the plate is decorated with your baby's name, dreidels and "potato latkes." Plates measure approximately 8 1/4" and are made from imported Italian bisqueware which is dishwasher and microwave safe. This makes an excellent gift! All plates are custom made to order and ship directly from the designer.